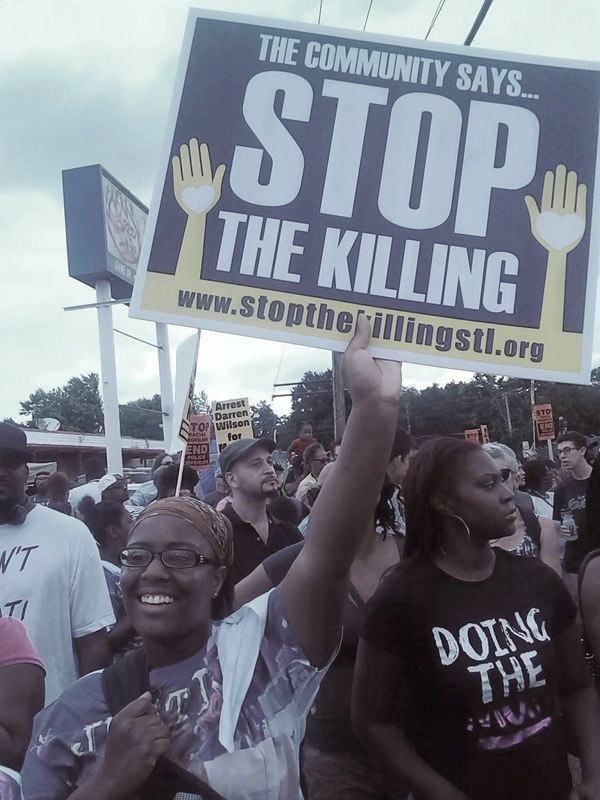 FERGUSON, Mo.—Organizers of the National March On Ferguson said 10,000 people joined their protest against police killings, police brutality, racial profiling and legal cover-ups. 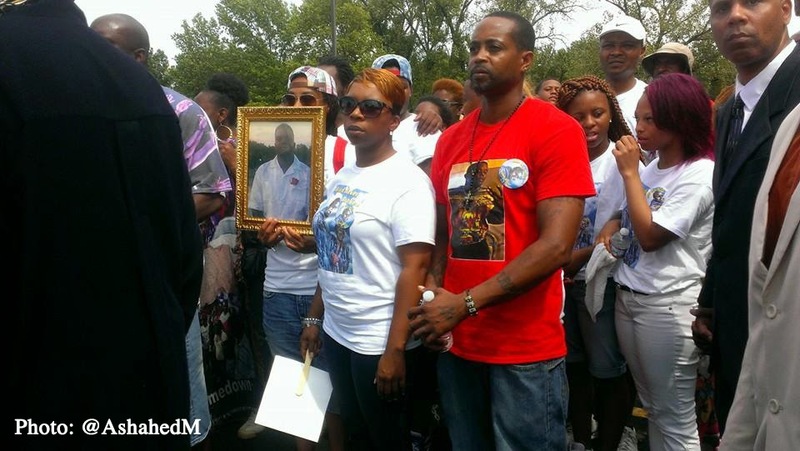 The father of slain teen Michael Brown spoke at the Aug. 30 park rally. 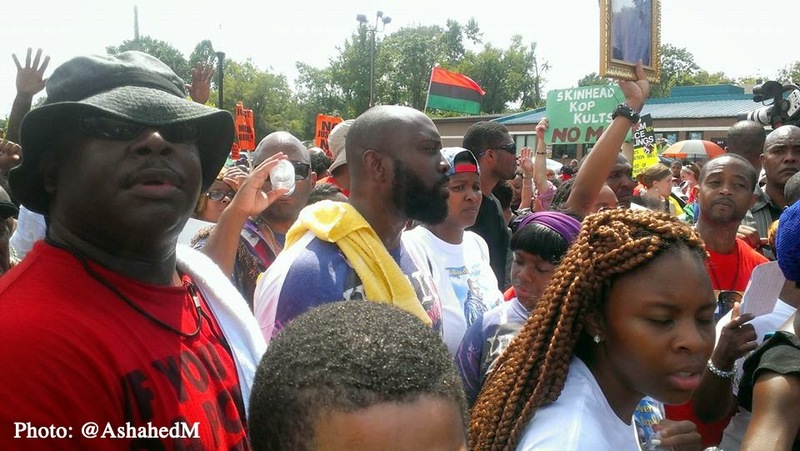 The mother led a march from the park to the Ferguson police station. 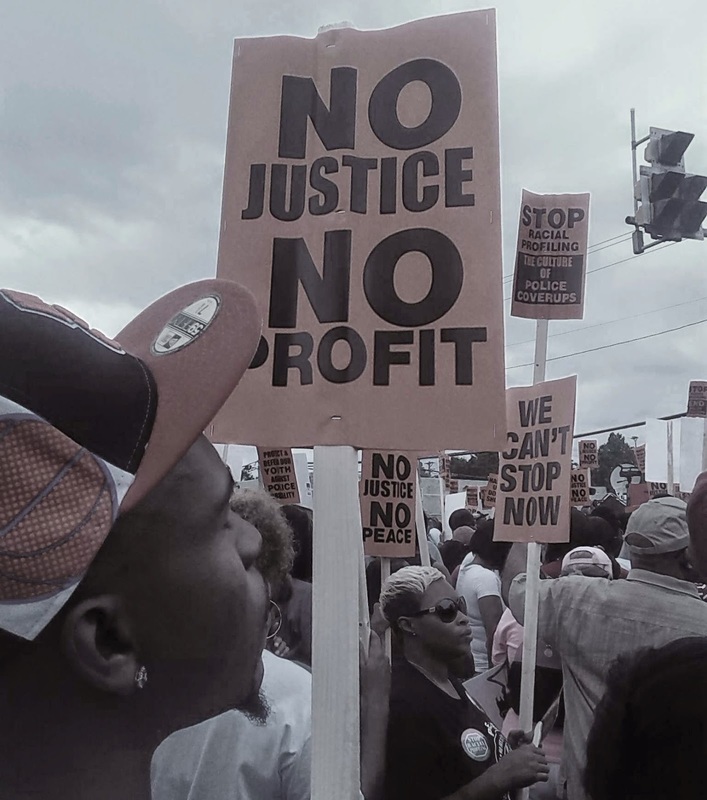 The Justice for Michael Brown Leadership Coalition started the gathering at 10 a.m. at “Ground Zero,” Canfield Drive and W. Florissant Avenue in Ferguson, Mo., in St. Louis County. 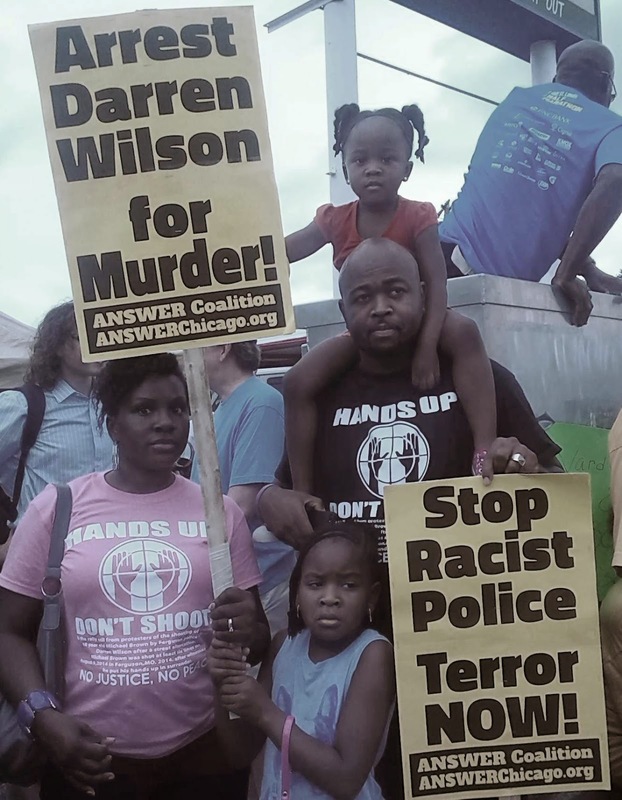 The march was another step in efforts to obtain justice for the unarmed Black teenager shot to death by Ferguson police officer Darren Wilson, who is White. “Enough is enough,” said Michael Brown, Sr., speaking through a bullhorn to a crowd outside the police station. The father called for justice for his son and all those who lost loved ones to police violence. He and Lesley McSpadden supported the removal of county prosecutor Robert P. McCulloch from the case. There is wide concern, from street to protestors to Rep. Lacy Clay (D-Mo. 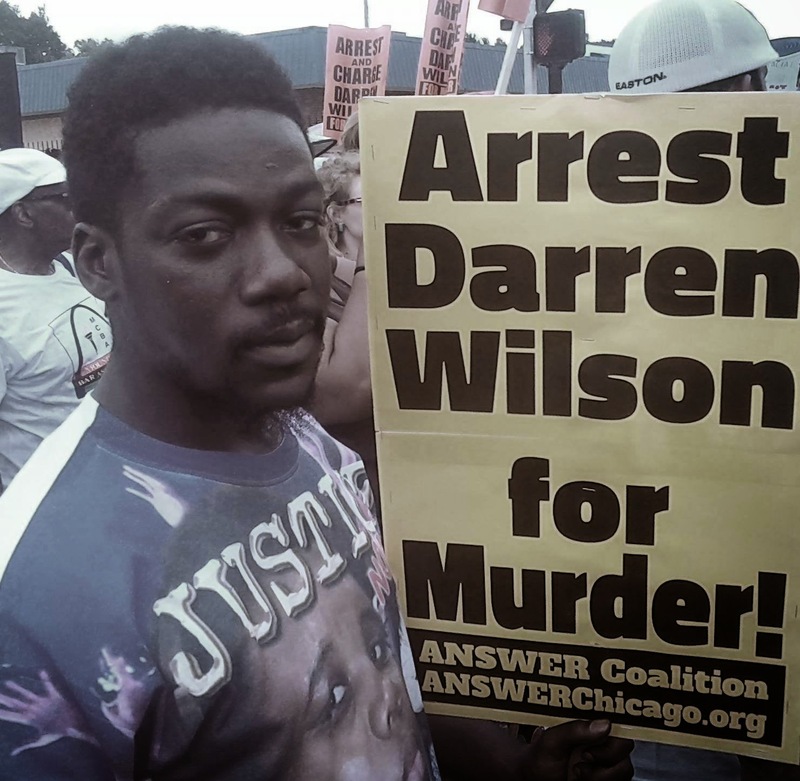 ), that the prosecutor will not vigorously investigate and prosecute Wilson. The still hurting father and street activist Anthony Shahid, who called on Gov. Jay Nixon to “man up,” want McCulloch removed under a state of emergency law enacted by the Democratic governor. Action items and plans for civil disobedience were presented at the rally. 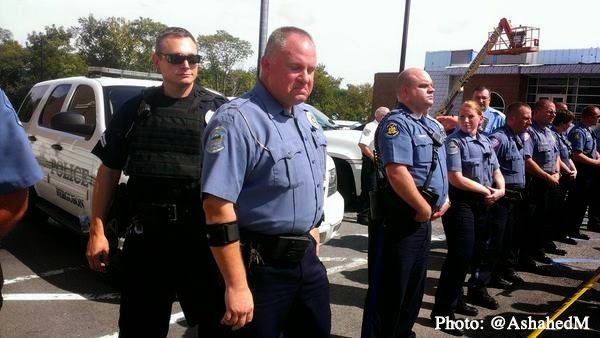 The actions include a Monday afternoon traffic slowdown at 4:30 pm on highways around St. Louis, which connect Ferguson and other nearby suburbs, said Shahid. The time and the four and a half minute slowdown will mark the four and a half hours Mike Brown's body lay in the street, he said. If the prosecutor is not removed and Blacks don't benefit financially and from employment throughmajor projects underway, the civil disobedience will increase, he said. Marchers proceeded down Canfield Avenue to the place where the unarmed teenager was killed, shutting down a major thoroughfare. Stopping near the place where the Ferguson police officer pumped at least six shots, including a fatal kill shot to the head of the 18-year-old, religious leaders and activists said prayers and vowed to keep fighting for justice. The crowd, many carrying signs and others carrying children, filled lawns in the Canfield Green Apartment complex, steps and the street. Marchers were very spirited, cooperative and disciplined in allowing the family to move from one place to another in a highly emotional moment. From the makeshift street memorial the crowd marched back up to W. Florissant Avenue, heading east toward the Ferguson Sports Complex in Forestwood Park. There was a little confusion as initial fliers had said there would be a rally at the police station. The marchers stopped in the park and a program began on a crowded portable stage. Lead march organizer A. Akbar Muhammad of the Nation of Islam talked about the need to involve youth and the need for sustained protests. There was tension at times as some marchers felt the demonstration had been taken off course by coming to the park. Tension eased as young people spoke and there were assurances marchers would go to the police station. 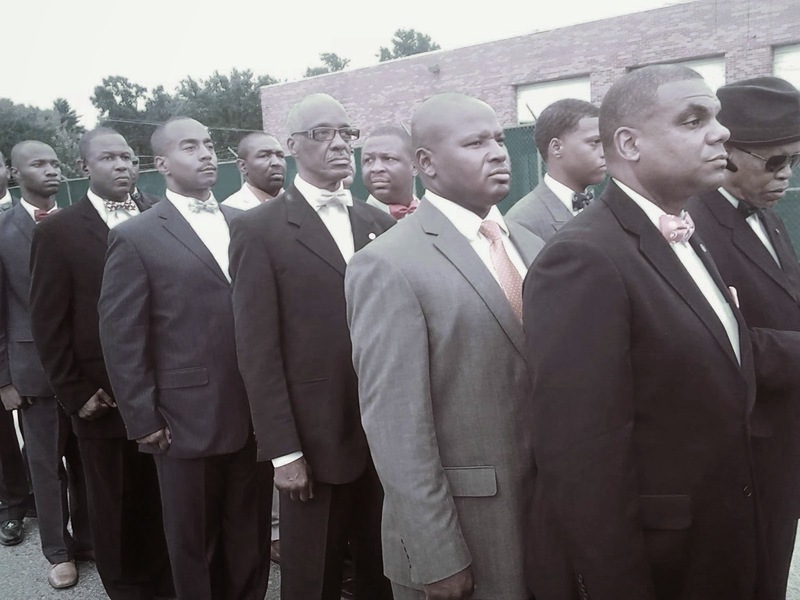 The Fruit of Islam, men of the Nation of Islam, secured the family and helped manage the event. But neither pouring rain nor drizzling rain dampened the spirits of march participants. Young people talked of assaults on peaceful protests by police and how they are mistreated regularly by cops. Speakers spoke passionately about unity seen since the Brown tragedy. Revolution is the only way, added other speakers, condemning America’s corruption and failure to respect Black life and Black rights. 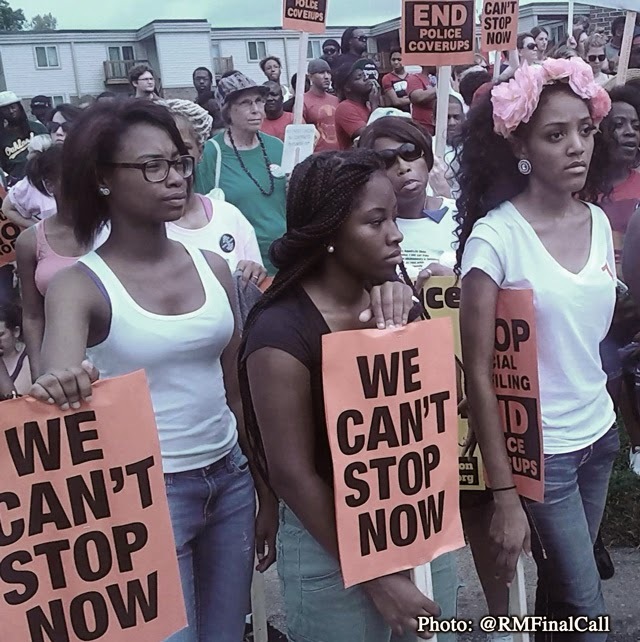 Youth leaders from Lost Voices were among rally speakers and longtime activist Zaki Baruti shared the coalition's five major demands, which prosecution of Wilson and the immediate resignation of Ferguson Mayor James Knowles and Police Chief Thomas Jackson. The demands also include a federal probe of police actions in local jurisdictions like Ferguson near St. Louis, racial profiling, traffic stops and revenue derived from traffic stops.